This weekend the 2018-19 Jazz at the MAC season at the McConnell Arts Center in Worthington gets started under the direction of pianist and musical director Tony Hagood. Hagood and a cast of talented musicians produced four excellent concerts for his first series in 2017-18 – his Brubeck tribute was fantastic – and this season will pick up where they left off. Tony Hagood presents Movie and TV Themes Reimagined at the McConnell’s Bronwynn Theatre on Friday, November 16th at 7:30pm. Tickets and more details are available here. The season continues in the new year with concerts covering Horace Silver, modern jazz, and Rhapsody in Blue. Hagood was kind enough to answer my questions via email, so keep reading to learn more about this weekend’s concert and upcoming events, as well as video footage from last season. Congratulations on your very successful first Jazz at the MAC series! Do you have any favorite moments or memories from last year’s concerts? Tony Hagood (TH): I’m a sucker for standing ovations. It’s great when the audience perceives the vast amount of work that went into getting a concert together and enjoys it so much they give a standing ovation. We went 4 out of 4 last year. It was also great to sell out the last two concerts of the series, Gershwin and Nat King Cole. Do you have any goals or vision for your new season, or any points of focus in preparing these four concerts? TH: While we will still bring the same premium performances and put our hearts into each of these concerts, I am shifting our focus on the first and third concert to try to encompass all demographics (Movie and TV Themes Reimagined, Nov. 16th) and even a crowd enthusiastic about today’s shifting jazz idiom (Jazz Today! March 8th) I think it’s important to attempt to provide a concert series that meets a variety of tastes. Another goal for myself was to write even more charts this time around and delve even deeper into the creative process. Although we just finished a production, Renaissance Magic at the Lincoln Theatre for which I wrote all the arrangements, I have been burning the candle at both ends to meet and even exceed my goal this time around. I was very interested to hear about your upcoming season debut, “Movie and TV Themes Reimagined.” How did you go about choosing tunes from the wealth of great themes in the movie and TV world? TH: First I took a look at the classics that have withstood the test of time and made sure to include several of those. I then focused on shows that already had jazz influences like Taxi, The Incredibles, Frasier, and put my own personality into those charts. Then I shifted gears and picked some of the most popular movie and TV shows from the last 20 years and put on my creative hat to turn them into something that they had never been. Although the last endeavor is undoubtedly my favorite, it is also the most time consuming. I wish there was an extra 24 hours in each day! Has any of the selected material presented particular challenges in your preparations? TH: Occasionally I’ll run into writer’s block. I’ll have an idea for an arrangement, get going with it, and just get stuck. This has been particularly troublesome for the theme from Pirates of the Caribbean. The more of a departure from the original, the more creativity is involved and sometimes that creativity is stubborn! When things like this happen, I put an arrangement aside and pick up something else from the first or second camp that is a little more straightforward and come back to the troublesome arrangement later. It usually works well! Tell us about the members of your band for this show. What do you think each of these musicians add to the sound of ensemble? TH: I’m excited to be working with some of the greatest musicians in Columbus. I’m so lucky to be able to call these guys and have them join me on these concerts. Each musician is at the top of their field. Meagan Cramm is a very experienced violist who plays as the principal violist in several symphony’s in central Ohio. She is also a violist from the McConnell Arts Center Chamber Orchestra. 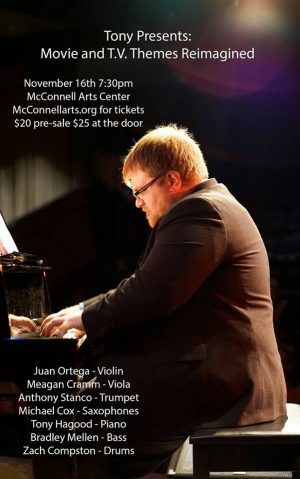 Juan Ortega is an amazingly accomplished violinist that is active as the principal violinist in several orchestras in central Ohio, teaches many aspiring musicians, both privately and at Mount Vernon Nazarene University, as well as plays in the McConnell Arts Center Chamber Orchestra. Michael Cox plays for the Columbus Jazz Orchestra and teaches at Capital University. He is one of the best soloists in town. Anthony Stanco is relatively new to Columbus. He has been here for a year or two and is originally from Michigan. He is heavily involved in the scene up there, currently teaches at OSU, tours the world with his group, and is currently potentially up for a Grammy nomination for a project he worked on! Anthony plays really great and knows just what to do to add to the ensemble. Zach Compston is not only an amazing drummer, but a brilliant educator as well. He is the Director of Education and Community Engagement at the Jazz Arts Group. He plays in many projects around town and heads to Alaska yearly as a judge for a large jazz festival that is hosted there. Zach is great at reading what is going on in the band and supporting it in just the right way to make us all sound great. Bradley Mellen is a multi-faceted musician that is comfortable on the bass, cello, and even has some piano chops. He is an extremely creative individual that helps out with some of our arrangements, and plays with many groups in and out of town. Bradley has huge ears and offers not only a lot of support, but also offers a lot of inspiration by the ideas he has both during melodic statements as well as in solo sections. TH: Besides Movie and TV themes we are presenting an exciting concert of Horace Silver’s compositions, a pioneer of the hard bop era, January 25th (tickets here); Jazz Today!, which is music composed by still living composers that have continued to shape jazz as we know it March 8th (tickets here); and our season finale Gershwin’s Rhapsody in Blue and other favorites April 5th (tickets here). The series is an amazing opportunity and I’m glad to be the featured artist/leader for the 2nd year in a row. In addition to the series I play many gigs in and out of town. November 29th, I’ll be leading a band of great musicians at the Lincoln Theatre for their Backstage at the Lincoln concert series. I do my best to keep my dates updated on my website tonyhagood.com – Check it out or subscribe to my mailing list to stay up to date! Next post: JazzColumbus Weekly – November 15th, 2018 – 5th Anniversary Edition!